Much digital ink has already been spilled on the plans for the burial of the remains of England's King Richard III, discovered under a car park in Leicester in August of 2012. From the location of the re-interment to the rite and creed of the ritual itself, nearly every detail has courted controversy from some quarter. 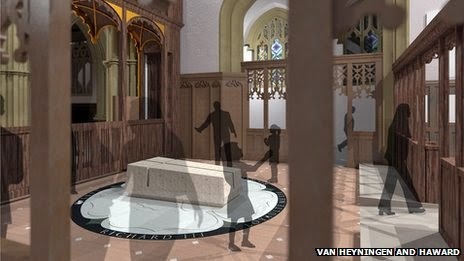 The present proposed burial site, Leicester Cathedral, has been approved by a high court ruling, which supporters of a more traditional location at York (including some distant relatives of the king) have indicated they will not challenge. One should note that Leicester Cathedral was not raised to its present status until 1927, and the impetus for the Leicester reburial ultimately comes from the university who dug the king up and local officials. The planned funeral will follow traditional medieval lines. However, the officiating clergy will, to my knowledge, be Anglican, rather than Catholic, a decision which has caused not a little concern in certain circles. The late king, England's last before the Tudors, lived long before Canterbury's break with Rome, and lived in a world immersed in medieval Catholic piety. 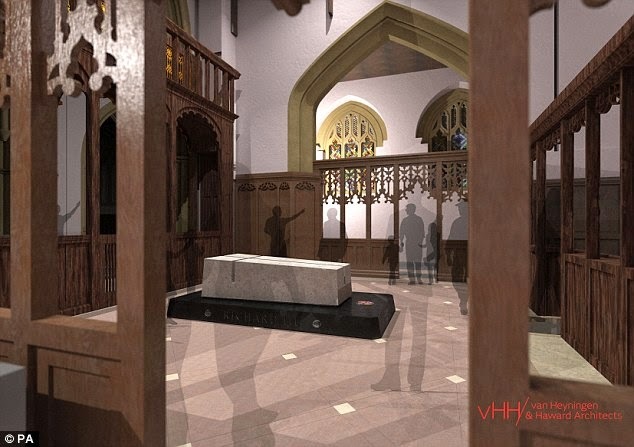 The most recent design for the king's proposed tomb will probably raise even more eyebrows: the object resembles nothing so much as a large granite kitchen island. A previous design for the tomb was unveiled in November but put on hold amid the legal challenges the reburial has faced. The original plans called for a budget of £1.3 million. The original design was to be carved in Swaledale fossil limestone and laid upon a large inlaid pavement in the shape of a rose surrounded by a black band in which the king's motto Loyaulte me lie would be inscribed. Only £96,000 of the original total estimated budget was actually slated for the vault and tomb; the project also includes a relocated crossing-altar and wooden parclose screens; it appears the low-laying tomb will actually be occupying the cathedral's old chancel. A new garden area outdoors seems to be part of the budget as well. 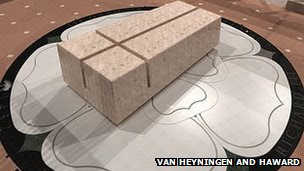 An even earlier plan recommended a simple flat slab incised with a cross, but this proved so disappointing that several backers withdrew their support. The revised design retains the core element of the composition, a skewed, vaguely Brutalist block of marble incised with a cross. It dispenses with the oversized, rather kitschy inlaid rose on the floor (described by one cathedral official as "not universally liked") for a quieter step of black stone inlaid with the royal arms in full color. Despite this simplification, the budget has now risen to £2.5 million. In some respects, there is nothing truly wrong about the design, but there is very little right, either. The black marble plinth and the royal arms are rather dignified additions and an improvement on the rose pavement. Overall, however, it is a great disappointment. It is possessed of a postmodern timidity and museum-like detachment. 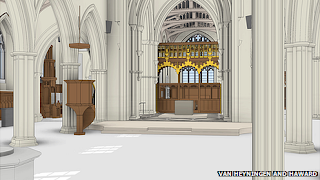 Yoking the project to an au courant liturgical re-ordering complete with an undersized, exposed freestanding altar was already problematic, but the proposed tomb itself is at odds both with the fabric of the church and the medieval world which Richard III was in some respects the last royal exemplar. 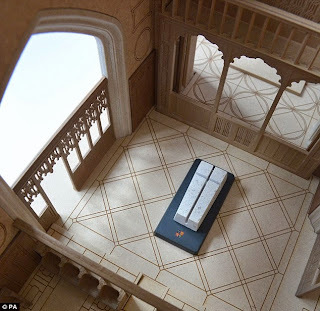 It resembles a diagram of a contemporary idea of what a medieval tomb ought to look like, at about ten removes from reality, done as a sort of dead design exercise, rather than an attempt to grapple with the organic realities of the Gothic. They have turned Richard III, a man who, whether or not Shakespeare was accurate, could never be called dull, unto something tasteful, quiet, and timid. Turning the former chancel into a potentially high-traffic tourist area also opens up all sorts of other troubling liturgical implications. Given that the latest and greatest exemplar of British Gothic revival, Stephen Dykes-Bower, was practicing up to his death in 1994, in a style both characterized by a vigorous imagination and a careful understanding of the sources, and his work was completed with the stupendous new Gothic crossing-tower built at St. Edmundsbury by Warwick Pethers within the last decade, that the public should have this mute slab foisted upon it, and upon the memory of a complex and perhaps misunderstood monarch, is inexplicable, and shows both a lack of artistic courage and historical imagination. Instead, I applaud the historian who has commissioned a splendidly medieval funeral crown for the body, as well as the gentlemen of the Richard III Society who unveiled a somewhat restrained but handsome and historically-informed concept for the tomb themselves early last year. The past is not dead; it's not even past. What is needed here is not postmodern timidity or even archaeological exactitude but the ability to think, breathe, and yes, pray, like a medieval man, and translate that passion, beauty and life into funereal cold stone. It is a pity that nobody in England appears up to the task.